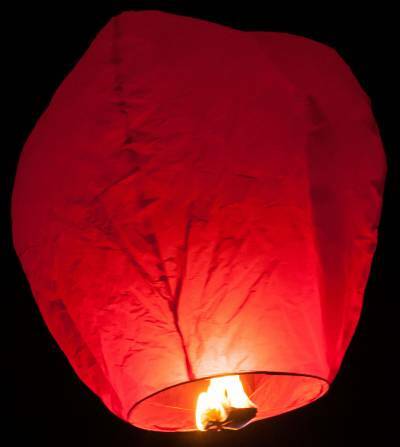 Sorry, we are currently sold out of Red Sky Lanterns. Please check back later. 88.9% of respondents would recommend this to a friend. I will buy this product again. I will buy this product again. Shipped fast for a last minute memorial for a list loved one. When concerned that it would arrive on time I contacted the company and they were very considerate and prompt with responding to my concerns. Will definitely use them again. Best deal on bulk I've seen yet. Great fun for any special occasion. Great fun for any special occasion. These lanterns were just beautiful and so much larger than one hers we have tried. Yes indeed, the perfect thing for celebrating any and all events, however...I find them to be very relaxing to abserve while in flight and can be an educational thing for the younger crowd. I am a sixty seven year old man and even I myself enjoy watching their flight but for the most part I enjoy showing the younger ones that there are different wind directions at different altitudes, you will always find two wind directions and a third would be the bonus one. I show the kids how to not just watch it's flight, instead, study it, and when they do...I will have to man-up and admit, some of their questions I can not answer (then back to the research board for me). All-and-all...it's fun, relaxing, learning, stimulating. Having a dog-day? Send a couple up and enjoy your flight. The lanterns are so wonderful and relaxing to watch as they float into the night sky. The highlight to a perfect evening! The highlight to a perfect evening! By One Flesh Marriage Ministry From Port Arthur, TX. These sky lanterns were easy to use and safe! We used them for a Valentines Dinner given for our marriage ministry. Each couple read a scripture, and released the lanterns...absolutely beautiful. Shipping time was great!